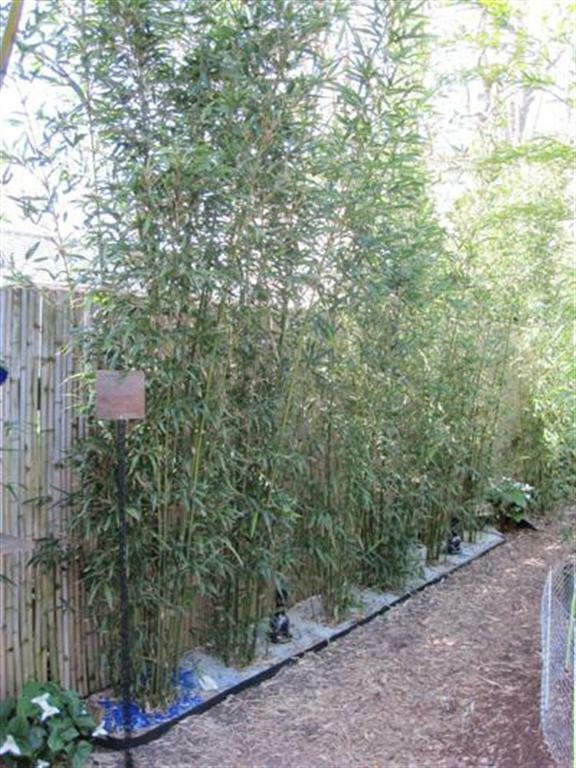 Rhizome barrier may be used for any clumping or running types of bamboo. 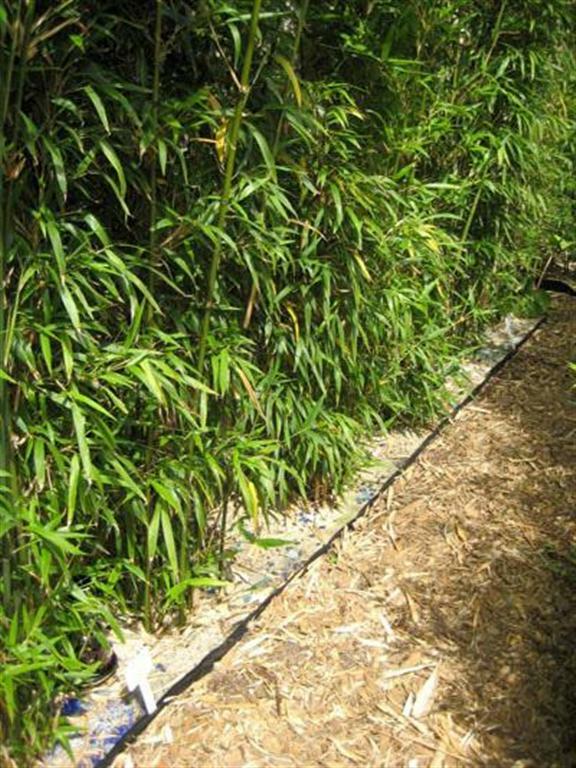 We always advise using a barrier to protect bamboo rhizomes from growing over property lines. Be careful when digging around electrical, cable, irrigation, gas, and water lines. Best to call your local utility company before you dig. They will be glad to come out and mark your areas in question. Before you dig call phone number 1-800-424-5555 or dial 811. Photograph to left shows trench ready for plastic root barrier. Walls straight up and down. Bottom of trench level from one end to the other. Cut all sharp roots flat so plastic lays flat against soil walls. Remove sharp rocks and other objects sticking out of walls that may puncture holes in plastic. Next unroll plastic clockwise inside trench and overlap ten feet. Sometimes we install two layers of 40 mil. plastic for custom job. Doubling up on plastic will insure stronger longer lasting results. 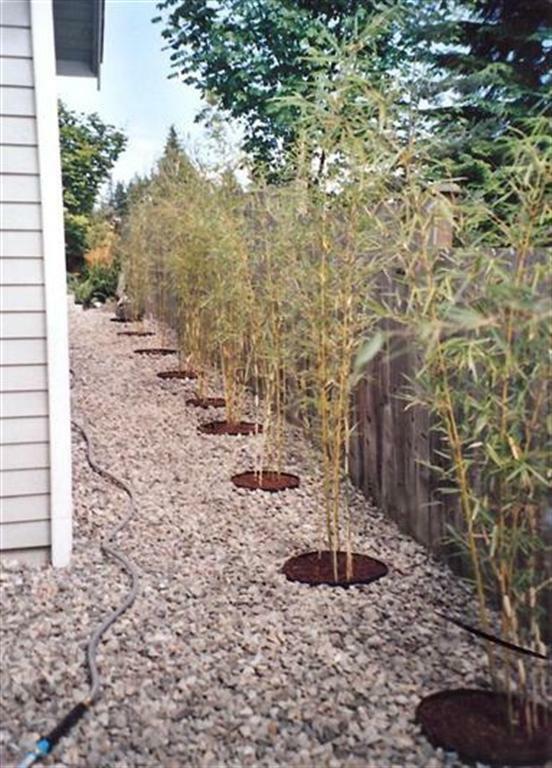 Bamboo sticks are used to hold plastic in place while replacing soil back into trench. Sticks can be taken out after plastic is set firm. Water all plant material after installation is complete. Now your done. Go relax. 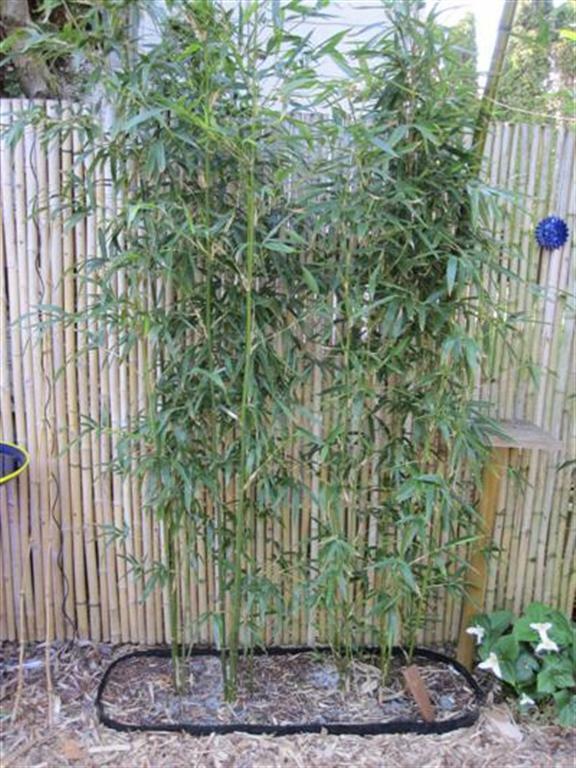 Remember to water your newly planted bamboo once or twice every 7 days until plants become established. Takes about a month for plants to root in solid. As weather gets warmer, remember to keep watering your bamboo. The more you water, the more it will grow. Planted in 2007. Semiarundinaria fastuosa 'Viridis in a 13 foot long containment at our nursery. We used 40 mil. thick 24 inch deep root barrier. 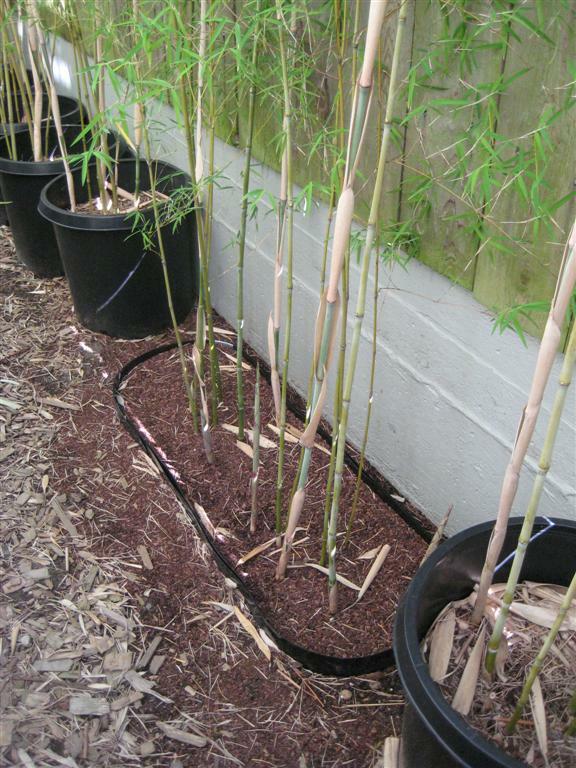 Six 5-gallon size containers of bamboo were planted. Better view of same installation as above. One inch white sand covers the soil inside. One inch blue crushed glass at one end. One inch root barrier shows above ground. We keep a look out for bamboo rhizomes that may jump over the one inch exposed barrier. When rhizomes jump the barrier we snip off with clippers. A 24 inch diameter circle enclosing black bamboo at our nursery. Installed in 2007 using 25 inch deep root barrier. One inch of the barrier is exposed to sunlight. We did a double wrap of plastic on this install. 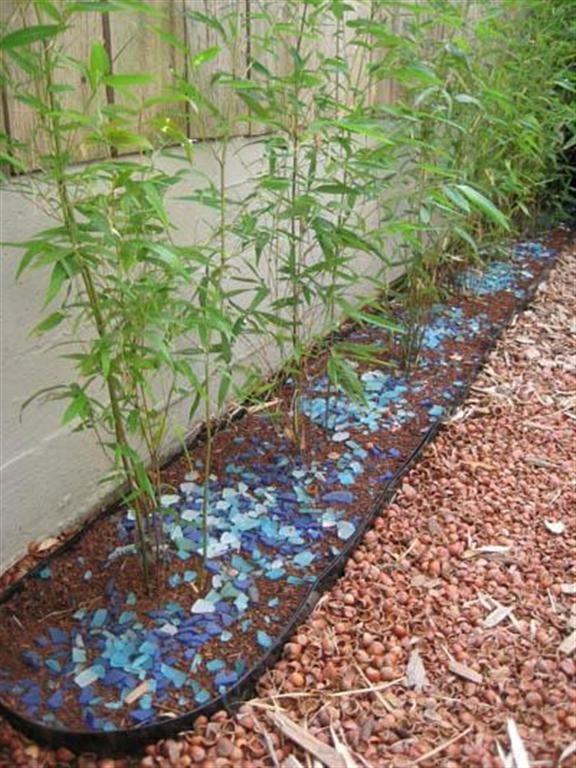 Crushed blue glass for decoration can be added. A recent 2009 four foot long by 16 inch wide installation at our nursery. Twenty five inch deep 40 mil. thick plastic root barrier was used. We doubled up on plastic for extra strength. This bamboo will max out at about 18 to 20 feet tall. A recent (2009) 10 foot long installation of Ph. aureosulcata 'Alata' at our nursery. We used six small plants for this install. Plants will max out at about 18 to 20 feet tall. Hazelnut shells surround the area. Also topped off with one inch bark mulch inside, with pieces of polished glass. Here we created 10 small circles for 10 Fargesia robusta bamboo plants. Each circle is 16 inches diameter by 24 inches deep. Plants will grow no more than ten feet tall in two or three summers. Just what the customer ordered. Another 4 foot long by 16 inch wide installation at our nursery. Thamnocalamus crassinodus & Thamnocalamus crassinodus 'Kew Beauty' planted side by side. In a couple of years a nice privacy screen will grow above the fence.